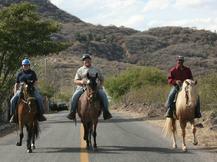 Trail ride leaving the rancho -- no rental horses here! Please Note that the horses at RDP are all privately owned, and we do NOT offer rental horses, horseback riding lessons, or trail rides for the public. But there are two local companies who do offer rental horses and trail rides. now under contract for closing this year. covered parking, and upscale finishing and details. See Hacienda Alta Development for details on these lots that are still available. 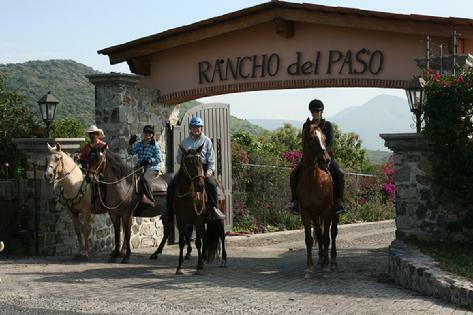 GARDEN COMPOST FOR SALE Genuine Hot Composted "Paso Poop"
Welcome to Rancho del Paso (RDP), a Premier Equestrian Center / HorseBoarding Facility and its subdivision "Hacienda Alta", a Country Living Gated Community at Lake Chapala, Jalisco, Mexico. RDP is the northern half of the property, and contains the owners' house and equestrian facilities. Hacienda Alta is on the south portion of the property -- it is a small gated subdivison of 6 building lots within the walls and fences of RDP. There are stalls for 5 boarders at RDP. The horse boarding facility offers private stalls and paddocks for each horse, a 90' x 125' riding arena, a round pen, veterinary stocks, horse wash area, hay and feed storage, and generous turnout areas. For the rider, the stable facilities include large, secure tack storage areas and an adjoining lounge with a fridge and microwave, and rest room facilities, and easy access to miles of country roads for your riding pleasure. Hacienda Alta is a secure, serene and luxurious place to live, in the quiet pastoral hills above the lake, yet within a 10-15 minute drive to the Chapala lakefront malecon and restaurants, to the supermarket and Walmart, tennis courts in La Cristiana park, or golf course at the Chapala Country Club. The views are vast and sweeping, the lake breezes refreshing, and the quiet pastoral surroundings are blissful. Hacienda Alta offers 6 home sites (five of which are still available), each with breath taking views of Lake Chapala to the south, and majestic mountains to the north. Homeowners' views and privacy will be preserved as the surrounding land falls off steeply to 3 sides, and on the north side it borders the edge of RDP's equestrian center turnout area, devoted to lush grass pastures for the owners' horses and the horses from the boarding stable (a maximum of 12 horses on the property). 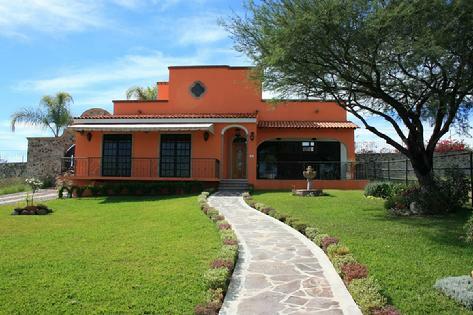 Hacienda Alta is a private, gated subdivison created on the southern edge of the Rancho del Paso property, a first class horse boarding facility. HISTORY: The land at RDP was once part of the enormous Hacienda La Labor, which was a working hacienda up until the 1930s. Then the land became "ejido" land (communally owned), and most of it has since passed into private ownership, including RDP's acreage. The little town of Hacienda La Labor, which you pass through on the road up to RDP, is the remnant of the hacienda's nucleus. It has about 200 inhabitants, an elementary school, and a brand new plaza built by the government a few years ago. HACIENDA ALTA HOMES: Only 6 homesites are available at Hacienda Alta, each with spectacular Lake views and room for extensive terraces, gardens and water features. The lots are cleared and finished with secure perimeter fences/wall and a paved interior access road with conduits for underground utilities. ACCESS FROM CHAPALA: RDP is reached via well paved asphalt roads heading 1 mile east from Chapala and then 1 mile north into the hills above the lake. PERIMETER: RDP is fully enclosed by stone walls along the paved public road, and 6 foot high chain link fences covered with bougainvilleas on the other 3 sides. The stone wall has a wrought iron topping with security alarm wiring on top of it. Hacienda Alta residents have their own automated gate and clicker/intercom for entrance to Hacienda Alta; RDP's boarding stable clientele are restricted to the use of the RDP north gate and north parking lot. HACIENDA ALTA UTILITIES: Fully underground utilities (electric, water, and telecommunications) run beneath the private, paved interior access road. Water is provided from SIMAPA's public Chapala water supply which runs alongside the rancho; electricity and phone lines are run from the CFE/Telmex lines on the road outside RDP. RDP STABLES: Ten 12'X12' stalls with adjoining 12'X22' private paddocks, plus an over-sized individual foaling/stallion/overflow pen, and individual covered cross-tie areas in the arched arcades outside each stall. HUGE tack room and boarders' lounge with fridge and bathroom. Six of the stalls are occupied by the owners' prize-winning Peruvian Paso horses - hence, Rancho "del Paso". Hacienda Alta residents have "first dibs" on any boarding stall availability at RDP. EQUESTRIAN FACILITIES: Grass-covered turn out areas (irrigated in the dry season to stay green), 125' x 90' riding arena, 50' round pen. Large, secure tack/equipment storage, roomy stalls with private paddocks. Wash area and vet stocks. Access to miles of trails and dirt roads. Boarders' parking lot inside the secure walled perimeter. Fee based trailer parking available. CLICK HERE to see a Google Earth view of Rancho del Paso and Hacienda Alta. At the top left are the stable facilities - round pen, stalls, feed room, tack room etc. The owners' house is at the top right. The horse pastures are in the middle, with the Hacienda Alta lots at the bottom.